Lashing out at the Badal government in Punjab and the Kejriwal government in Delhi for the stepmotherly treatment being meted out to government and other employees in their respective states, Punjab Congress president Captain Amarinder Singhon Monday promised all possible steps to ensure redressal of the long-pending demands of the employees in Punjab on priority basis after coming to power.Captain Amarinder appealed to the Punjab employees to join hands with his party to restore the state to its lost glory, assuring them that the next Congress government in the state would address their problems without delay post the Assembly elections, with regularization of contractual employees on top of the party agenda.Addressing a mammoth rally here, Captain Amarinder said while the Badal-led SAD-BJP government in Punjab had completely ignored the interests of government, especially contractual employees, Arvind Kejriwal’s government in Delhi had pushed employees to a state of despair. 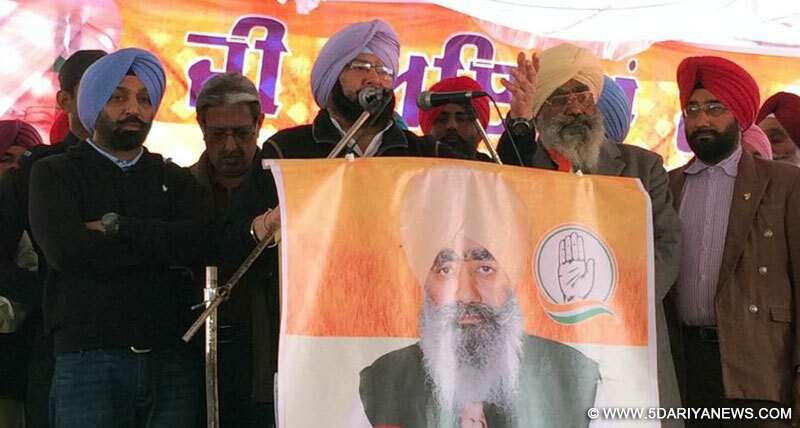 Employees in both the states had been victimized and subjected to severe harassment by the governments led by Parkash Singh Badal and Arvind Kejriwal, respectively, he added.The Congress, he said, was committed to addressing the problems of the government employees. Captain Amarinder promised regularization of all contractual employees in Punjab once his government takes over the reins of powers in the state. Pointing to the plight of teachers in Punjab, he assured early redressal of their problems and said their long-pending demands would be addressed on priority by the next Congress government.The PPCC president also referred to the pathetic conditions in which policemen were working and said sweeping police reforms, as promised in the party manifesto, would be brought in once the government is formed. Fixed duty hours with regular offs, free medical insurance, time-bound promotion and shifting from VVIP duty to law and order were some of the reforms planned by the party, he said.Referring to the plight of government employees in Delhi, Captain Amarinder said the AAP government was totally oblivious to the problems of the government and other employees, who continued to face problems of non-payment of salary and other dues, etc. MCD workers in Delhi had been forced to strike work as a result of non-payment of their salary, he pointed out, adding that even the teaching staff of private schools had been reduced to a pitiable state with the Delhi legislative assembly amending the law to make it easier for such schools to cut the salaries of teachers. Given the state of employees in Delhi, Kejriwal and his party could not be trusted with the interests of employees in Punjab, said Captain Amarinder, adding that it was in the interest of the employees to ensure that the Congress is elected with a clear majority.The Congress manifesto has listed out several measures to improve the lot of employees in Punjab. The Congress government will ensure expeditious payment of the pending DA and other dues of employees, while also expediting finalization and implementation of the report of the 6th Punjab Pay Commission after hearing all representative employees’ associations/organizations.Ensuring payment of full salary on recruitment to the government service as per rules, regularization of all adhoc and contractual employees recruited through transparent systems and procedures, and ensuring regular annual recruitment of critical core employees against the sanctioned posts are other promises of the Congress for Punjab employees.The manifesto further says the Congress government will not allow recruitment of contractual staff against the regular sanctioned posts and will discourage transfers unless these are warranted because of any disciplinary actions/proceedings or hardships of employees.